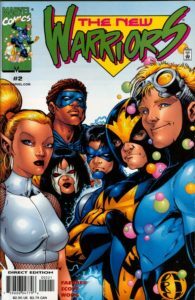 The New Warriors comic books definitive issue-by-issue collecting guide and trade reading order for omnibus, hardcover, and trade paperback collections. Find every issue and appearance! Part of Crushing Krisis’s Crushing Comics. Last updated November 2018 with titles scheduled for release through July 2018. 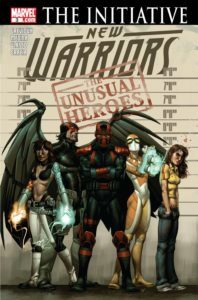 This guide covers every series titled New Warriors, plus acts as a complete reading order for all of the major New Warriors characters: Night Thrasher, Namorita (AKA Kymaera), Firestar, Marvel Boy / Justice, Speedball (AKA Penance), Rage, and Silhouette. Nova is covered in his own guide. If you want to dig deeper to follow the complete chronology of all of the New Warriors characters, here’s the complete Table of Contents! 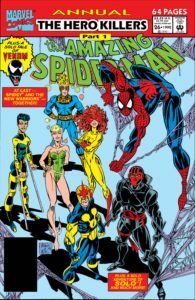 Firestar was already known to the public via Spider-Man and His Amazing Friends by the team she debuted as a supporting character in Uncanny X-Men #193. 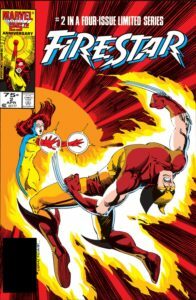 Firestar’s mini-series was released on the heels of her debut in Uncanny X-Men #193; the first half of it precedes the story in that issue. Previously collected in Digest format and in the Women of Marvel Omnibus. Marvel Comics Presents (1988) #82-87 (2nd story): Not collected. Firestar is the featured hero in this story. It’s a pity this wasn’t captured in her 2017 Origins TPB. Marvel Boy is nearly as old a character as Namorita, having debuted in The Defenders and played a supporting role to Thing. Namorita is a long-standing Namor supporting character beginning in 1972, so she has plenty of appearances prior to New Warriors. Marvel Comics Presents (1988) #12 (4th story): Not collected. A solo story. 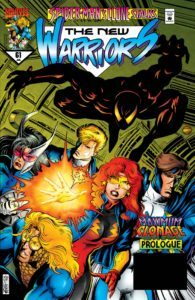 Nighthrasher debuted in #411 in the formation of the New Warriors, so all his prior stories are in the form of flashbacks. Nova is such a long-standing character that he has his own guide! See Nova for more details. Since Nova has his own guide including all of his appearances, his guest appearances are not listed here with an abbreviation. Rage was a supporting character in Avengers prior to joining New Warriors. Speedball’s debut is a little tricky. By release, his first appearance was Marvel Age (1983) Annual 4 (2nd story). However, since Marvel Age was mostly a magazine and not a comic, his debut is widely considered to be Amazing Spider-Man (1963) Annual 22, released around the same time. To make things even more confusing, in story order his first chronological appearance as a hero is Speedball (1988) #1 – which closely followed on the heels of the other two books! Marvel Comics Presents (1988) #127 (2nd story): Not collected. Thor #411-412: The team’s debut, which is collected along with New Warriors’s #1 in several formats immediately below. 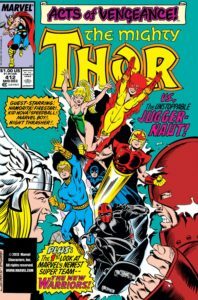 Though Thor #411 is their first appearance, portions of New Warriors #1 precede that story. Also, see Thor. Collects Ghost Rider (1990) #1, Deathlok (1990) #1, New Warriors (1990) #1, Foolkiller (1990) #1, Darkhawk #1, Sleepwalker #1, X-Force (1991) #1, X-Factor (1986) #71, Warlock and the Infinity Watch #2, Death’s Head II (1992a) #1, Silver Sable and the Wild Pack #1, Terror Inc. (1992) #1, Night Thrasher: Four Control #1, Darkhold: Pages from the Book of Sins #1; material from Captain America Annual #9. A 90s trade paperback. Does not include the final page of #4. Collects the team’s debut in Thor #411-412. 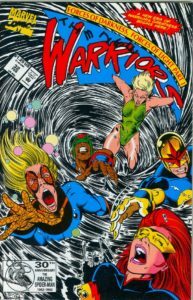 Annual 1 is part of a crossover through New Mutants (1983) Annual 7, New Warriors (1990) Annual 1, X-Men (1963) Annual 15, and X-Factor (1986) Annual 6 – the first stories of which are included here. Back-up stories in New Warriors Annual 1 come after the crossover. The first story from Annual 1 is also collected in X-Force Omnibus, Vol. 1 and in b&w in Essential X-Men, Vol. 11. Also collects Avengers #341-342, which directly follow #17 and stars the team except for Speedball. Earth 616 New Warriors do not appear in #11-12. #18-21: Not collected, except in Omnibus, above. #22-25: Nothing But The Truth. Not collected, except in Omnibus, above. Rage joins in #22. #26: Not collected, except in Omnibus, above. Annual 2 is a crossover through Amazing Spider-Man (1963) Annual 26, Spectacular Spider-Man (1988) Annual 12, Web Of Spider-Man (1985) Annual 8, and New Warriors (1990) Annual 2. Also, see Marvel Universe Events. Infinity War: See Marvel Universe Events. Infinity War begins after Annual 2 and ends after #27, which occurs during Infinity War #3. Issue #27 is a part of the event and has been collected along with Infinity War. Also collects Night Thrasher: Four Control #1-4 and material from Marvel Holiday Special #2. Issue #27 occurs during Infinity Gauntlet, above. Several team members do not appear in #28. Marvel Boy departs in #29. Night Thrasher occurs between #31-32. #32-34 & Annual 3 are the story “Forces of Darkness, Forces of Light.”Hindsight begins to appear in #35. Marvel Boy returns in #36. Night Thrasher #1 in Marvel Firsts, above. Si in #1 & 3-4, Na in 2-3, SpB in 2. Infinity Crusade: See Marvel Universe Events. Occurs between #36-37. Infinity Crusade (1993) #1 (Na,NT, Ra, Si, SpB). #37-39: Family Values. Not collected. #40-42: The Starlost. Not collected. Marvel Boy changes his name to Justice as of #42. Not collected. The reading order for this crossover is NW47, NT11, N6, NW48, NT12, N7, NW49, NW50. Speedball departs the team in #50. #51 & Annual 4: Not collected. Silhouette departs the team in in #51. Justice, Vol. 2 (1994) #1-4: Subtitled “Four Balance.” Not collected. Begins after Annual 4. NW #52 falls between #2-3, NW #53 falls between #3-4. Firestar appears in every issue. Night Thrasher, Vol. 2 #13-19: Not collected. #54-59: Not collected. #59 continues to Nova #18. #60: Nova Omega. Not collected. Continued from Nova #18. Members of the team make several appearances in the three-year gap between their first and second series. 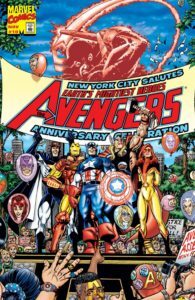 Firestar and Justice leave New Warriors to join Avengers after that string of guest appearances. Their Avengers appearances arecovered below. After their 1999 series, members aside from Firestar, Justice, and Namorita don’t appear again for nearly half a decade, save for a handful of guest starring spots. Namorita goes on to be a supporting cast member in Fantastic Four and The Order. Speedball makes a handful of appearances. Every appearance in this section stars both Firestar and Justice unless noted otherwise. #501-503: See Marvel Universe Events. This is Avengers Disassembled. An irreverent take on the team that stealthily sets up Civil War. 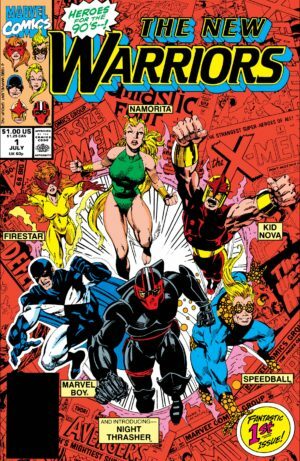 Cast included Speedball, Namora, Night Thrasher, and Nova. 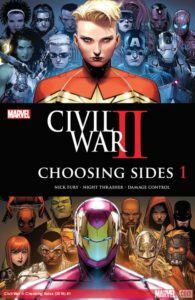 Reprinted in 2015 as Civil War Prelude: New Warriors. Firestar in Great Lakes Avengers (2005) #2 (flashback), New Thunderbolts (2005) #6 & 12, I ♥ Marvel: Masked Intentions (2006) (2nd story), She-Hulk Vol. 2 (2005) #8, Civil War: Front Line (2006) #2 & 7, Civil War: Casualties of War (2007) #1, X-Men: The 198 Files (2006) (editorial content), and continues to The Initiative, below. Justice in Great Lakes Avengers (2005) #2 (flashback), New Thunderbolts (2005) #6 & 12, I ♥ Marvel: Masked Intentions (2006) (2nd story), Thing Vol. 2 (2006) #8 (flashback), She-Hulk Vol. 2 (2005) #8, Civil War (2006) #4-5, Amazing Spider-Man (1963) #538, Civil War: Front Line (2006) #7 (check placement), Fallen Son: Iron Man (2007), and continues to The Initiative, below. Night Thrasher in Civil War #1, The Amazing Spider-Man (1963) #532, Civil War: Front Line (2006) #7, and Marvel Spotlight: Civil War Aftermath (2007) #1 before next appearing in Avengers: The Initiative (2007) #10 and New Warriors (2007) #14-15, both below. Rage in She-Hulk Vol. 2 (2005) #8, Fantastic Four (1961) #539, Amazing Spider-Man (1963) #534, and continues to The Initiative, below. Silhouette returns in Civil War (2006) #4-5 and Iron Man Vol. 4 (2005) #14 before next appearing in New Warriors Vol. 4 (2007) #7, below. Speedball appears in I ♥ Marvel: Masked Intentions (2006) before he continues as Penance in Civil War, listed in his own section, directly below. 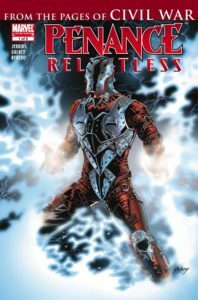 After Civil War, Penance joins the cast of a relaunched Thunderbolts and had his own mini-series. See Thunderbolts for collection information. Thunderbolts #122-126: See Thunderbolts These issues occur during Secret Invasion. Penance continues to Avengers: The Initiative, below. 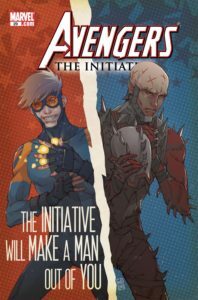 The Initiative was a series that directly followed Civil War, where an Avengers training ground attempted to field enough heroes to provide a team to each state. Justice and Rage were ongoing stars, joined later by Penance; Firestar and Night Thrasher made guest appearances. See Young Avengers & Avengers In Training for collection information. Firestar only appeared twice in The Initiative #10 & #28. She continues from here to Marvel Divas listed with the Heroic Age, below (though in continuity it may fall prior to #28 – unclear). Justice was an ongoing star of this series in #1-8, 10-12, 21-23, 25-26, 28-35. From #35 he continues to the Heroic Age, below. Night Thrasher made a handful of appearances in The Initiaitive in #10, 28, 32-33. 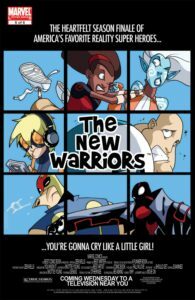 He made other appearances in this period which are noted in New Warriors (2007), below. Penance arrives here from Thunderbolts via New Avengers #48 and appears in #25-31 & 33-35. That marks the end of his Penance appearances, though he appears later in Thunderbolts (1997) #163.1. Rage was an ongoing star of this series in #1-6, 8, 10-12, 14-15, 21-23, 25-26, 28-35. From #35 he continues to the Heroic Age, below. Launches out of Civil War. This is a strange mashup with X-Men, with several heroes depowered in Decimation joining the team with new technologically-driven power sets (Wondra is Jubilee, Decibel is Chamber). Night Thrasher appears in #14-15 after Avengers: The Initiative (2007) #10. Rage appears in #8, 11, 14-15 interspersed with his Initiative appearances, above. 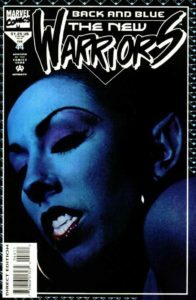 Silhouette appears in New Warriors Vol. 4 (2007) #7-8 & 11 after Iron Man Vol. 4 (2005) #14. Night Thrasher next appears in Nova (2007) #20, Marvel Assistant-Sized Spectacular (2009) #1 (may not be in continuity), Avengers: The Initiative (2007) #28, Marvel Divas (2009) #3, Avengers: The Initiative (2007) #32-33. Silhouette does not appear again until The Heroic Age. FF (2011) #11 and Fantastic Four (1961) #600, before joining the X-Men in Wolverine & The X-Men #19 and Amazing X-Men #1, which are covered in Marvel Now, below. Justice appears in (approximately) Enter The Heroic Age (2010), Heroic Age: Heroes (2010) #1 (check placement), Avengers Vol. 4 (2010) #1, I Am An Avenger (2010) #2-5 (set earlier in continuity alongside Avengers (1998)), Avengers Academy (2010) #1-6, Ant-Man & Wasp (2011) #3, Avengers Academy (2010) #7, 9-11, 13, 15-16, 19-20 – plus, not checked for continuity, Chaos War (2010) #1, Annihilators (2011) #3, before continuing to Marvel Now, below. 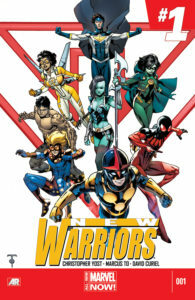 A New Warriors revival with Justice and Speedball at the core along with a new Nova. Silhouette later joins. Prior to New Warriors, Justice and Speedball appear in Nova (2013) #7-10, during which they assist and then recruit the new Nova, Sam Alexander. See Nova. 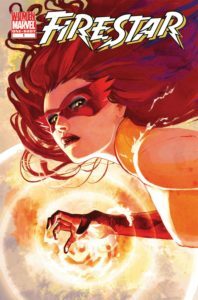 Firestar joins the X-Men and appears in Wolverine & The X-Men (2011) #19, Amazing X-Men (2014) #1-2 & 4-6, Nova (2013) #10, Amazing X-Men (2014) #7, Annual 1, & 8-12, Original Sin (2014) #2-3, Uncanny X-Men (2013) #21-26, Amazing X-Men (2014) #15-17 & 19, Wolverines (2015) #6, and Spider-Man & the X-Men (2014) #1 & 5-6. Speedball also appears in The Amazing Spider-Man (2014) #1 (after #9), and after New Warriors in All-New Invaders #13. Firestar has yet to reappear. Justice has yet to reappear. Silhouette has yet to appear. Check Amazon for Marvel’s newest New Warriors titles.